Hockey Blog In Canada: Only 220-Grand More! See that card to the left? That's Upper Deck's newest holographic card that they are introducing for the avid hockey card collector. 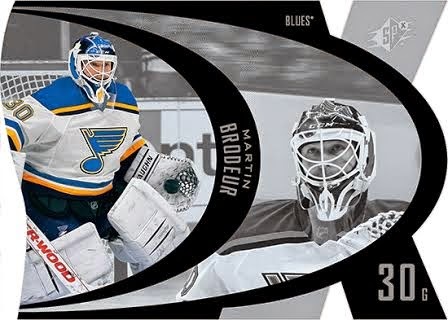 Martin Brodeur's addition to the St. Louis Blues roster was somewhat unexpected, but there was something that caught my attention more than the new logo on his chest and mask. Brodeur was called upon to relieve Jake Allen with the Blues trailing 3-0 to the New York Islanders. The Blues would rally and win 6-4, and Brodeur would suddenly find himself $20,000 richer. How, you ask? Brodeur has a clause in his contract that pays him money for every win he records! Brodeur was stuck at 688 wins in his career before signing with the Blues, and it was no secret that he was trying to become the first and only goalie to record 700 wins in his career. Whatever team signed him would have to deal with this somewhat personal record that has an effect on the team for which he's guarding the nets, so this return for one more season is kind of selfish in a big way for Brodeur. I don't know if that kept teams from signing him as he'll want at least twelve starts to try to capture that record. The Blues, knowing how ultra-competitive the Central Division is this season, decided to sweeten the pot in order to get the best out of Brodeur. For every point that the Blues record with Brodeur as the goalie of record, he'll earn $10,000 per point. Not only is the a personal reason for Brodeur to win, but there's now a monetary reason for him to want to excel since his base contract is worth just $700,000 for the remainder of the season. 12 wins = 24 points. $10,000 per point = $240,000. Number of starts during Elliott's injury > starts after Elliott's return. Number of wins needed = 11. When Brian Elliott returns from his injury, it's not going to be easy to manage this three-headed goaltending monster. Elliott, for all intents and purposes, is the starter. Jake Allen is the goalie of the future for St. Louis. Martin Brodeur is the legend who just needs a few more wins before he can go away with his record that may never be touched. Who sits? How will the Blues manage this? Maybe a better question is about the precedent that this contract sets. If you had a veteran forward who is over the age of 35, you could simply offer a base salary of $1 million, and then offer a $10,000-per-point bonus clause as a way to maximize your investment. If you elder statesman doesn't perform as well as you had imagined, the team only invested a million dollars and change. But if you suddenly got a rejuvenated veteran who scores 60 points, suddenly you have a solid player that cost you $1.6 million - cheap investment for today's 60-point player! That, though, is another article altogether as we concern ourselves with the only play-for-points-for-pay player in the NHL. The one thing I can see that would hurt the Blues and, in turn, Brodeur's legacy is if he got his $940,000 ($700,000 base salary and $240,000 for 12 wins) and promptly retired. It's not like he needs the cash. That figure to the right is Brodeur's career earnings as per CapGeek, so the guy has made a few bucks in his time. That doesn't include any endorsement deals, and he seemed to be a pretty big deal in New Jersey for a long time. I'm sure he brought home a few dollars promoting whatever product or service was willing to pay him. Would a shot at one more Stanley Cup keep Brodeur around? You'd hope it would, but it's tough to carry three goalies all season. He could become part of the "black aces" in the playoffs in case there's an injury to Elliott or Allen, but he may not get his name on the Stanley Cup unless he appears for the team. I'm sure the Blues would still order him a ring, but he wouldn't officially be able to say he won a Stanley Cup with the Blues as a player if, y'know, he didn't play. So is this just about reaching another milestone? I hope not. I always thought Brodeur was about the team first before his own personal records. The Blues have sweetened the pot by paying Brodeur to earn them points, though, so maybe both goals can be achieved: a record number of wins through a milestone for Brodeur while helping the Blues to another excellent season. Seems like a pretty good payoff for both parties, no?